When you travel to or from Detroit, it is a good idea to make everything as easy on yourself as possible. From the quickest way to book your flight to the most efficient way to get from the airport to your hotel, it is all about making life simple. The simpler the process, the less that can go wrong. That is why you should consider booking parking at Detroit airport in advance, and make one more step in the process easy and worry free. There are about seven park and fly services at Detroit Metro Airport (DTW) at which you can book a space ahead of your trip. Most are located to the northeast of the airport terminal. Wayne County Detroit Metropolitan Airport, thankfully usually called by a shorter name (like Detroit Metro Airport, Detroit Metro or simply DTW), is roughly 20 miles from the city of Detroit near I-94. Detroit serves as a hub for Spirit Airlines, the main hub for Northwest Airlines, and Northwest partner airlines Mesaba Airlines, Compass Airlines and Pinnacle Airlines also have hubs at DTW. Some of the things that have made the city famous also make their presence known at the airport, with shops featuring items made by GM, Henry Ford and Motown Music. For traffic information, see the Detroit News website. Planning a long drive to or from the airport, or an odd-hours flight? 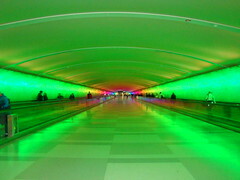 Check out Detroit Airport (DTW) park and sleep hotels. Don’t fancy driving to the airport? Or leaving your car there and paying for parking? Catch a shuttle to Detroit airport.